HouseboatReservations.com is dedicated to all things houseboats. 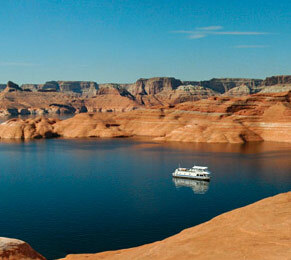 Our team of highly trained experts specialize in assisting customers with planning and reserving houseboat adventures. At no cost to you, our knowledgeable agents will assist you with your choice of location, choosing the best houseboat to fit your needs and budget, as well as, selecting the best powerboats and water toys. At HouseboatReservations.com we believe that the best way to have a perfect houseboat vacation is to plan the perfect houseboat vacation. Browse our growing site to learn more about the different destinations we book and spend some time looking at the houseboat fleets, powerboats and water toys that are available to you at each marina. Then give one of our knowledgeable houseboat experts a call! Let us get all of your questions answered and assist you with planning the perfect houseboat vacation, or request a call back from one of our agents and we will contact you as soon as possible. HouseboatReservations.com is owned by National Park Reservations (NPR), one of the oldest and largest independent provider of reservation and information services for National Parks and gateway communities throughout the United States and Canada. Over the past several years NPR has assisted over 20 million people with planning their ideal vacation. Nobody knows the great outdoors better. So give us a call to plan and book your next houseboat adventure at Lake Mohave, you’ll be glad you did!